Frederick Minns was born in Cockfield, Suffolk around 1911. He was the son of Isaac and Violet Minns. He had 2 brothers: Cecil and Dennis, and 3 sisters: Winifred, Dorothy and Freda. His father Isaac was employed as a farm labourer and the family moved from Cockfield to Spout Lane, Little Cornard and later to 4 Prospect Hill, Great Cornard. 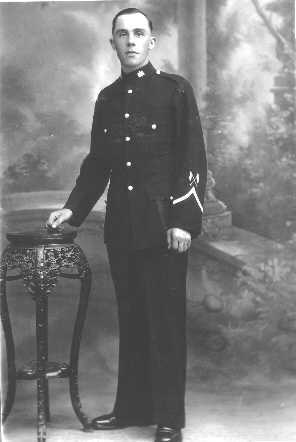 Frederick was a regular soldier and served with the Suffolk Regiment in India. The photograph shows him in India in 1933. The Battalion returned home and at the outbreak of war was sent over to France as part of the British Expeditionary Force. Frederick survived the evacuation of Dunkirk at the end of May 1940. In September he was serving as a despatch rider when he was killed in a road accident in Cheddar, Somerset. Frederick died aged 29 on 27th September 1940. He lies buried in Great Cornard Churchyard. Both his brothers served during the war. Cecil enlisted in January 1940 and served with the York and Lancaster Regiment, he sent a letter home, which appeared on the front page of the Suffolk and Essex Free Press on 5th November 1944. He had been in India for 2 years before being sent to fight behind the Japanese lines in March 1944. His brother Dennis served with the Royal Air Force in South Rhodesia.